Ever since her grandmother died, Samantha Davidson has been carrying a secret: She can hear voices — other people’s thoughts, some from the living, some from the dead. Will she heed their voices as they accuse of her of a dark secret she has buried deep in the past? Or will she surrender to the light offered by newfound allies and a love that caught her by surprise? 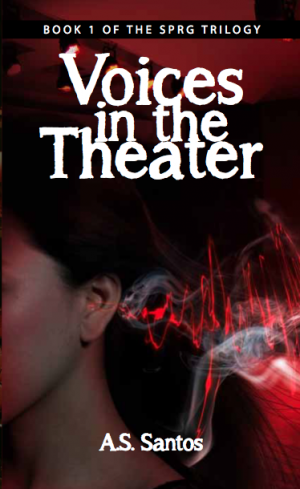 Voices in the Theater is the first installment of A.S. Santos’s three-book Young Adult Paranormal Romance. Follow Sam and her friends in the Student Paranormal Research Group as they encounter bizarre and often dangerous supernatural occurrences, battle demons both spiritual and psychological, and navigate adolescence and young love.